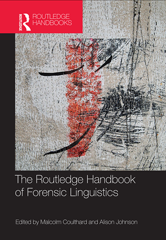 The Routledge Handbook of Forensic Linguistics provides a unique work of reference to the leading ideas, debates, topics, approaches and methodologies in Forensic Linguistics. Forensic Linguistics is the study of language and the law, covering topics from legal language and courtroom discourse to plagiarism. It looks at the linguist as expert providing evidence for the defence and prosecution, investigating areas from blackmail to trademarks and warning labels. The Routledge Handbook of Forensic Linguistics includes a comprehensive introduction to the field written by the editors and a collection of thirty-seven original chapters written by the world's leading academics and professionals, both established and up-and-coming, designed to equip a new generation of students and researchers to carry out forensic linguistic research and analysis.